and equipped with swimming pool, lounger, spa and restaurant to name but a few facilities. Palace wing, Garden wing and Villa Lapa. Prices from €639 which inludes a lot more than a normal city break !! Hotel Olissippo Lapa Palace boasts 109 rooms distributed over three different sections; Palace wing, Garden wing and Villa Lapa. All rooms have been decorated with Portuguese style fabrics and furniture. There is a different decoration on every floor including Art deco, Colonial, Algarvian and Neo-Classic styles. 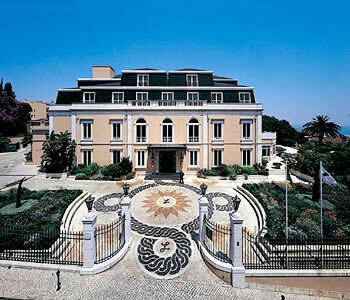 The Olissippo Lapa Palace, built in the 19th century, is set in a sub-tropical garden overlooking the Tagus River. From the hilltop where it resides, guests treat themselves to a world of luxurious pampering and amenities including an indoor and outdoor swimming pool, Turkish steam bath, sauna, fully-equipped fitness center and full-service spa. Three different wings -- the Palace, Garden and Villa Lapa -- are decorated in uniquely different styles including art deco, colonial, Algarvian and neo-classical.